Van Jones on “The Green Collar Economy: How One Solution Can Fix Our Two Biggest Problems” | Democracy Now! author of The Green Collar Economy: How One Solution Can Fix Our Two Biggest Problems. He is also the founding president of Green for All and the founder of the Ella Baker Center for Human Rights, which challenges human rights abuses within the US criminal justice system. While the global financial meltdown has been treated as a major crisis requiring government intervention, other critical issues have remained mostly off-limits to policymakers. A new UN report has revealed major US cities, including New York, Washington, Atlanta and New Orleans, have levels of economic inequality that rival cities in Africa. The [Organisation for] Economic Co-operation and Development found the US had the highest inequality and poverty after Mexico and Turkey, and the gap has increased rapidly since 2000. Meanwhile, environmental news continues to bring new warnings of threats to the planet. Recent studies show the rise in carbon dioxide emissions have outpaced even the most dire scientific projections. The Global Carbon Project says CO2 emissions rose nearly three percent last year. That’s at the high end of the projections from the world’s leading scientific panel on global warming, the Intergovernmental Panel on Climate Change. Climate scientists have warned of massive environmental catastrophe if carbon dioxide emissions increase more than three percent. In a new book, the well-known community activist and attorney Van Jones lays out a plan for a green economy he says could help solve the nation’s economic inequality while also addressing the long-term environmental threats to our survival as a planet. It’s called The Green Collar Economy: How One Solution Can Fix Our Two Biggest Problems. The book has already hit the New York Times bestseller list. Van Jones is the founding president of Green for All and the founder of the Ella Baker Center for Human Rights. That group challenges human rights abuses within the US criminal justice system. Van Jones joins us now from San Francisco, where he is based. 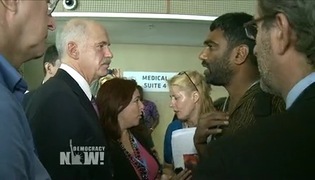 Van Jones, welcome to Democracy Now! It’s good to have you with us. Why don’t you lay out your main thesis? And talk about how it fits into, well, even this election, 2008, the kind of demands that you’re making. Well, first of all, I think it’s really important to point out that we’re sort of at the end of an era of American capitalism, where we thought we could run the economy based on consumption rather than production, credit rather than creativity, borrowing rather than building, and also, most importantly, environmental destruction rather than environmental restoration. We’re trying to make the case in this book that that era is over. We now have to move in a very different direction. And key to that will be basing the US economy not on credit cards, but based on clean energy and the clean energy revolution that would put literally millions of people to work, putting up solar panels all across the United States, weatherizing buildings so they don’t leak so much energy and put up so much carbon, building wind farms and wave farms, manufacturing wind turbines. We argue you could put Detroit back to work not making SUVs to destroy the world, but making wind turbines, 8,000 finely machine parts in each one, twenty tons of steel in each wind tower, making wind turbines to help save the world. So we think that you can fight pollution and poverty at the same time. We think that you can actually power our way through this recession by putting people to work, but we’re going to have to start building things here and re-powering, retrofitting, retooling America, and that that’s the way forward both for the economy, for the earth and for everyday people. How exactly do you expect to get support for this? We’re talking about a global economic recession. True, there has been $850 billion found to deal with the bailout of the banks, but what’s your plan, Van Jones? Well, you know, the good thing about it is that Senator Barack Obama has come out in the past week saying that this clean energy revolution is going to be his main priority. You’re going to see something very interesting happen in American politics. We’ll call it the rise of the green Keynesians, the idea that the government is going to have to play a role in the economy, we’re going to have even more deficit spending to kind of stimulate the economy, to move us through. And when you look at, you know, what should you spend that money on, last time we had a stimulus, we gave out a bunch of checks to people who ran out to Wal-Mart and bought flat-screen TVs, so we stimulated the economy — it was just the Chinese economy, not this one. The smart way to do a stimulus is to invest in infrastructure. And the smart infrastructure that we need right now is infrastructure that gets the price of energy down, that gets us more energy independent. All roads point toward a major investment in clean energy, probably funded in part by deficit spending on the part of the government. But let’s be clear. The real solution to this whole thing is to put a price on carbon. The biggest economic stimulus I can imagine would be a carbon tax or a cap and trade, cap and dividend, cap and cash back, some sort of cap on carbon, so that suddenly there is a market signal for private capital to start moving aggressively in a clean energy, low carbon direction. Once you do that, you unleash innovation, you unleash technology, you unleash entrepreneurship. Much more importantly, solar panels don’t put themselves up. Wind turbines don’t manufacture themselves. Everything that is good for the earth, that’s good for clean energy, gives a job and an economic opportunity. What we’ve got to do is capture that for people here who are going to be out of work, who are struggling, and use that as a springboard. You can’t build the economy on credit cards. You can build an economy based on clean energy, based on solar panels, based on wind, based on geothermal, smarter, non-food-based biofuels. There are literally — there’s literally, I think, a $100 billion play out there in clean energy for the United States, but not a whole lot of $100 billion plays in the economy right now. This is one of them. VAN JONES: —- is going to lead to globalizing risk and poverty, not prosperity, and it’s going to hurt the earth. And so, here we are now with the opportunity to go in a different direction. Van Jones, founding president of Green for All and the founder of the Ella Baker Center for Human Rights. His book, The Green Collar Economy: How One Solution Can Fix our Two Biggest Problems.